As we reported in April, Apple Senior Vice President of Industrial Design Jony Ive has been leading a thorough overhaul for iOS 7 that focuses on the look and feel of the iOS device software rather than on several new features. Sources have described iOS 7 as “black, white, and flat all over.” This refers to the dropping of heavy textures and the addition of several new black and white user interface elements. Sources say that over the past few months, Apple has re-architected iOS 7’s new interface several times, so until the new software is announced at WWDC, interface elements could dramatically change from what Apple has been testing internally in recent weeks. In software design meetings with Apple’s iOS designers, accompanied by Apple’s Human Interface vice president Greg Christie, Ive has shared his reasoning behind his distaste for the texture-heavy (skeuomorphic) interfaces heralded by Apple co-founder Steve Jobs and former iOS chief Scott Forstall. Ive stated that software designs filled with physical metaphors do not stand the test of time, according to a person familiar with the design meetings. According to this person, Ive also shared that because iOS’s current applications have several differing designs, Apple’s users could become confused. For example, the current yellow notepad-inspired Notes app contrasts significantly from the silver-textured Maps, blue and white Mail, and casino-inspired Game Center apps. But now that over half a billion devices running Jobs’ and Forstall’s iconic system have been sold, Ive has the immense challenge to make Apple’s software as clean and seamless as his glass and aluminum devices, all while making the software remain simple enough to resonate with customers. For the upcoming operating system, which Apple says will be unveiled at its June Worldwide Developers Conference, Ive has not simply picked areas of the software design to tweak. 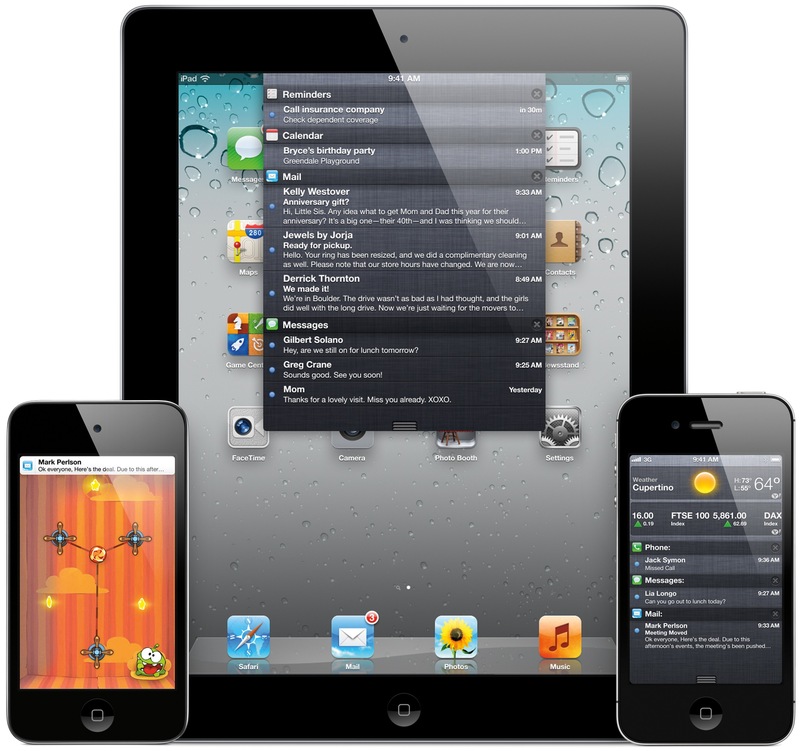 He has essentially made his mark on every corner of the operating system, according to descriptions from sources, all while mostly keeping the essence of what has made iOS so ubiquitous. 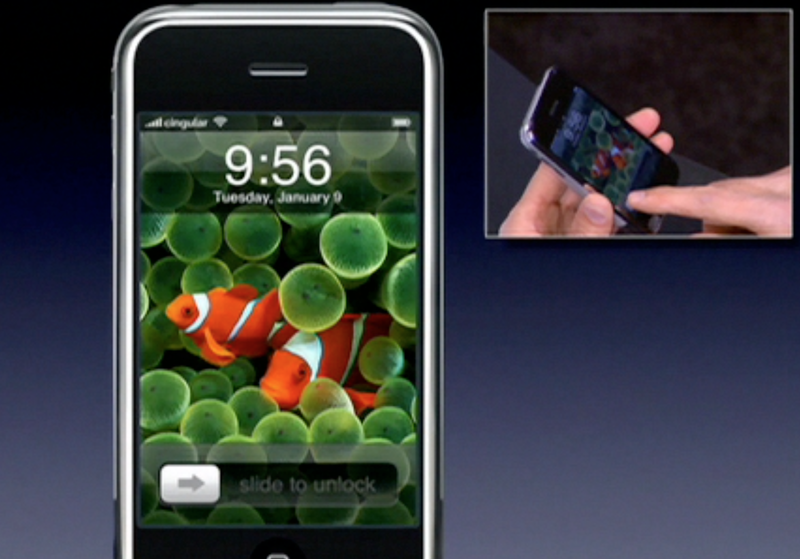 When Steve Jobs unveiled the iPhone to the gushing crowd at his January 2007 keynote address, one of the first breakthrough moments for spectators is when Jobs took his finger to perform the slide-to-unlock gesture on the iPhone’s Lock screen. Since that day, the iPhone’s Lock screen has mostly remained the same. With iOS 7, Apple will drop the shiny, transparent time bar on the top of the Lock screen in exchange for a shine-free, black interface. Additionally, the square-grid for entering a pin code has been replaced with round, black buttons with white text and white borders. Additionally, sources say that notifications on the Lock screen may see improved manipulability with gestures. Overall, the Lock screen is different than what users have become accustomed to, but it functions in a similar manner. Jony Ive has inspired the iOS design team to replace many of the linen and leather textures found in iOS, such as in the iPad Calendar app, with flat white and black coloring. For instance, Apple’s Notification Center drop-down panel currently has a dark linen background. In iOS 7, according to people familiar with the software, this design becomes a dark grey/black color with white text. As we previously reported, the latest iOS 7 builds being tested include new panels for quick access to information. For example, in addition to local weather and stocks information (like as introduced in iOS 5), Apple is testing other widgets for Notification Center. Sources shared examples such as localized news feeds. Additionally, Apple is testing a dedicated, easily-accessible panel for WiFi, Airplane Mode, and Bluetooth toggles. As we previously reported, iOS 7’s Home screen design is mostly the same as the display of app icons found in iOS since the first iPhone. While the Home screen app icons lose shine, shadows and gloss, the buttons are still round and just as tappable. Also as we previously noted, most of the Apple-bundled app icons have been redesigned with flatter, less-skeuomorphic textures. Notable app icon changes for “flatness” are present for the Camera and Photos apps, while the Game Center logo loses the green felt and chess pieces. Additionally, panorama-like wallpapers (images that pan as Home screens are swiped) are also present. This feature makes sense in light of Apple adding panorama photography capabilities to some iOS 6 devices last year. Panorama wallpapers have existed in Google’s Android OS for several years. Additionally, navigation and tab bars have been redesigned to remove gradient textures. Some bars in iOS 7 are also said to include a minor blurring effect. In some apps, the Status Bar is less transparent than in iOS 6. iOS 7’s system-wide keyboard is similar the keyboard in previous versions of iOS, but the design is a lighter shade of grey and does not include shadowing. In addition to the Home screen buttons, most of Apple’s apps have been redesigned to fit the white, black, and flat theme of the new operating system. For example, the shredding animation for deleting virtual passes has likely been removed from Passbook. Additionally, the iPhone’s Notes app has replaced the yellow notepad design for a flat white look. Apps such as Mail, Calendar, and Maps have also gained a more uniformed look with flat white textures. While the core elements of those apps are mostly white, each app has been given a unique button color. Essentially, each app has a white base with a respective color theme. For example, the Calendar app could potentially have red buttons, while Messages could have green controls. 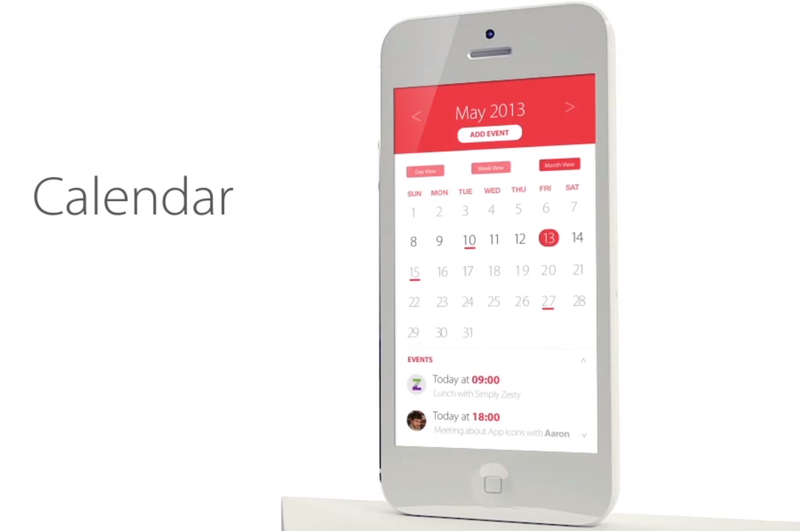 While not exactly accurate, the above concept art for a “flat” iOS 7 Calendar provides a fair representation of how the aforementioned red theme could be implemented. The actual iOS 7 Calendar’s UI changes are not as ambitious as depicted in the above concept art. While the Mail app, for example, is light on many changes, apps such as App Store, Newsstand, Game Center, Safari, Camera, and Weather have seen significant transformations. 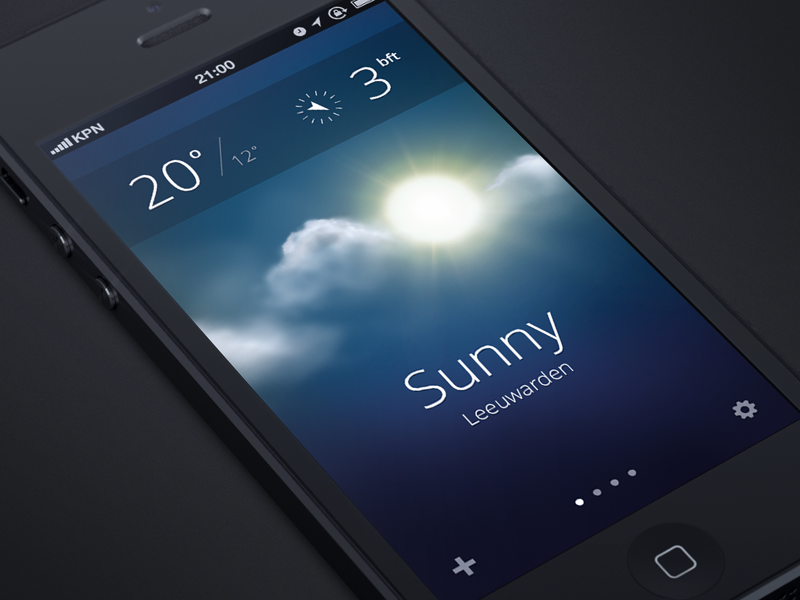 Apple’s new Weather application is said to include slightly animated images to notate types of weather such as rain, sun, or snow. One source says that it is similar to the above design recently posted to Dribbble. Game Center, unsurprisingly, has been stripped of green felt. Newsstand has been tweaked to remove the wood-shelf interface. It is likely that the wood will be replaced with a texture slightly reminiscent of OS X Mountain Lion’s app dock. Safari for iPhone’s design has been tweaked, particularly in the tabs view. The App/iTunes/iBook stores will pick up a flatter, white look (as opposed to the current dark black theme). Additionally, due to confusion from users looking to FaceTime, the iPhone may now include a standalone FaceTime app like the iPad and iPod touch. In previous versions of the iPhone software, FaceTime video calling has been tucked away into the Phone application. While iOS 7 is heavy on design changes, the operating system also includes some various new features across the board. We previously reported that iOS 7 will likely include integration for Flickr and Vimeo in addition to improved in-car support for Maps and Siri. While the new interface will be a major change for consumers, sources say that iOS 7 is also an ambitious update for developer-focused features. According to people familiar with iOS 7’s development, Apple’s designers and engineers are prioritizing an overhaul of the iPhone’s version of iOS over the iPad’s software. It is highly likely that Apple will release iOS 7 to customers this fall alongside new hardware. We are expecting Apple to release an iPhone refresh with improved internals in the fall. 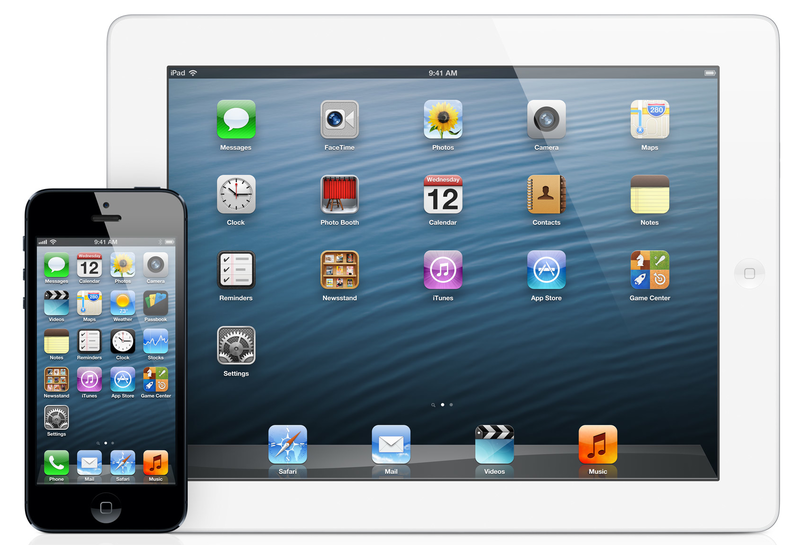 Additionally, Apple seems to be prepping new versions of the iPad and iPad mini for the fall.